On Eagles Wings Ministries (OEWM) held its Give Her Hope Inaugural Event on Saturday, January 17, 2015, in connection with the launch of On Eagles Wings Ministries Belize. The event featured a dinner, awards ceremony and live auction to raise funds for the non-profit organization. 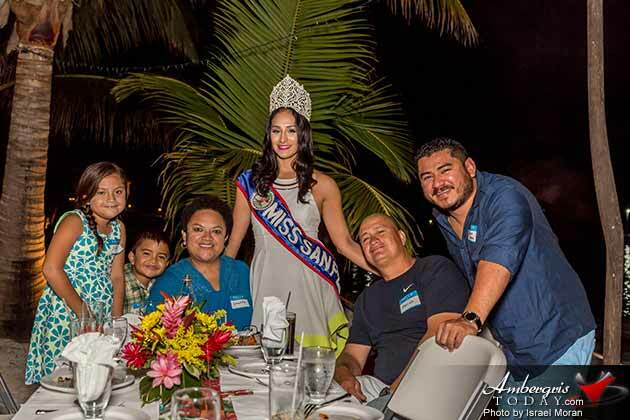 Miss San Pedro, Michelle Nuñez, a Belize Board Member of OEWM, worked diligently with the members of OEWM to organize the event as she prepares to launch activities for her branch organization SHINE. OEWM provides hope, empowerment, and a brighter future to girls who have been sexually exploited and those at risk. Work is in process to raise and acquire funds to construct a building where community activities, counseling, dance, liberal arts can be conducted. It will also be a help center and location for Miss San Pedro’s SHINE Girl’s Club. A land parcel has been acquired next to the San Pedro Fitness Center already. Michelle Nuñez’s SHINE Girl’s Club is a youth enrichment program for young girls. SHINE stands for Shaping Healthy Identities through Nurturing and Empowerment. Michelle says she will be working with girls between 13 and 16 to build up their self-esteem and motivate them to strive for a brighter future. Initially she plans to work closely with a small group of 15 participants and work on a program that will encompass sis main topics: Self-esteem/self-confidence, body image, sexual risk behavior, drugs and alcohol, decision making and communication skills/future goals and ambitions. Plans are underway to hold a special fundraiser for OEWN Belize in April. If you would like to assist in any way, make a donation or find out more of this great organization you can contact Michelle Nuñez at [email protected] or call +501-630-2560.